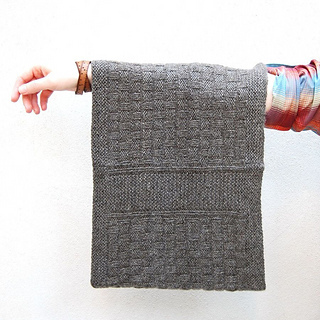 This cowl was inspired by Elfreth’s Alley in Philadelphia, the nation’s oldest residential street. It’s alternating panels of garter stitch and basketweave echo the cobblestone and slate street and the brick sidewalk that have been walked since the 1700s. 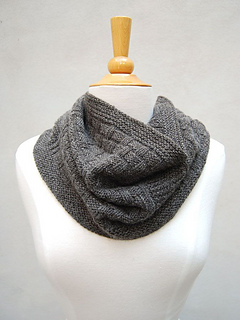 The cowl was designed for North Light Fiber’s Water Street DK. Made entirely in their Rhode Island micro-mill, it is a very special yarn that you’ll love to knit and wear. We also knit a version in Brooklyn Tweed’s Arbor. While Water Street DK is luxuriously soft, Arbor’s stitch definition makes the pattern crisp and clear. This pattern is available for free when you purchase 2 skeins of Water Street DK yarn or Arbor from Loop! Circumference: 26.5 inches, Depth: 10 inches. 2 skeins North Light Fibers Water Street DK (60% Super Fine Merino, 40% Cashmere) 165 yds. Shown in Pebble in the first 3 photos. 3 skeins of Brooklyn Tweed Arbor (100% American wool) 50 grams / 145 yds. Shown in Driftwood in the last 2 photos. 24-inch US 4 & US 6 circular needles. 5.5 stitches = 1 inch in garter stitch on US 6 needles.